Hi, welcome to a magazine dedicated to the beauty of our natural world and to an understanding of how this beauty can make a difference in our lives. 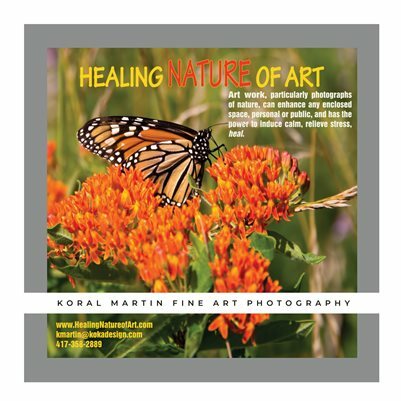 It features the photography of Koral Martin - my photography. Many of us enjoy getting away to commune with nature whenever we can. City living in this day and time frequently becomes a stressful task and often cries out for a change of scenery. Whether it’s a walk in a local tree and grass covered park, a hike to a cascading waterfall at a nearby nature preserve, or an afternoon loafing along the shores of a sunlit lake far from town, we come away refreshed and ready to face the world again. Views of such works of nature in our own, personal environment can have much the same effect. In order to help us through the day, every day, whether we’re in our homes, our places of business, or our public buildings, why not surround ourselves and those around us with the healing power and serenity of the camera-captured beauty of nature.